Heading into the NCAA women’s golf championship, Stanford head coach Anne Walker knew exactly whom she wanted on the course to capture the title. Walker was prophetic on both counts: After two victories by each team, the title did indeed come down to the last match, in which Stackhouse rallied from a 2-hole deficit through the 16th hole to force the game into a sudden death playoff, where she won the first hole, earning the program its first ever national championship by a 3-2 margin over No. 3 Baylor. Things looked bleak for the No. 4 Cardinal late through the matches: Although freshman Shannon Aubert locked up an early victory against Baylor’s Lauren Whyte, sophomore Casey Danielson, who had been up one against Baylor’s Laura Lonadari, lost hole 14 to even up the match late. With Lauren Kim and Quirine Eijkenboom appearing to have lost their matches, it all came down to Stackhouse, who was down by as much as three and trailed throughout, needing a come-from-behind effort to beat Hayley Davis and clinch the title. Knowing that their match would likely decide the championship, Stackhouse and Davis took aggressive shots at the famously stingy Concession Golf Club in Bradenton, Florida. The result was a brilliant back-and-forth display of shotmaking worthy of being a championship-deciding match. After winning the first hole, Stackhouse quickly fell behind against Davis, dropping five of the next seven holes. Stackhouse cut the lead to a single hole after chipping in for eagle at the short par-4 12th. Maintaining her slim lead through the 16th hole, Davis hit what seemed like the title-clinching shot, a screaming right-to-left shot out of thick mud that narrowly cleared another hazard before landing feet from the hole. Davis’ tap-in birdie left her two holes up with two holes to play. But Stackhouse never lost her focus. Stackhouse’s aggressiveness allowed her to hit the green on the par-5 17th in just two shots, while Davis reached the green in three. After Stackhouse two-putted for birdie, Davis missed the chance to seal the match, making par and losing the hole to Stackhouse. That cut the lead to one. Surrounded by her coaches and teammates, and under the eye of the Golf Channel’s team of cameras, Stackhouse approached the 18th hole knowing that only a birdie could keep her team alive. After a perfect drive down the right side of the fairway, Stackhouse’s approach left her with a 12-foot uphill putt. Davis kept the pressure on, rebounding after a short second shot to pick up a par. Stackhouse, down one, needed to make the putt to force a playoff hole. Stackhouse struck the putt hard, and the slow-moving ball had almost no break in its path to the bottom of the hole. Seven rounds of golf over six days were not enough to decide the national champion. In the first year that the new match-play format was used to decide the champion, Stackhouse did not wilt under the immense pressure of being one of the two final golfers on the field. As the most seasoned player on her young team that battled adversity all season long, the junior didn’t let the magnitude of the moment or their fatigue affect her mental approach. Stackhouse’s solid ball-striking did not fail her on the first playoff hole, as she hit the green in regulation, leaving a 16-foot putt for birdie and a national championship. Although she could not convert, her two-putt par left Davis needing to make an easy par putt to stay alive. Having seen the speedy right-to-left break on Stackhouse’s putt, Davis had a good read on a straightforward par attempt from three feet out. But the putt grazed the edge of the hole, sealing the Cardinal’s first national title. While the title swung on the incredible anchor match, the match-play format meant that the title was a true team effort. Stackhouse was put in position to be the hero by a wire-to-wire victory from Aubert and a tensely-fought win by Danielson. 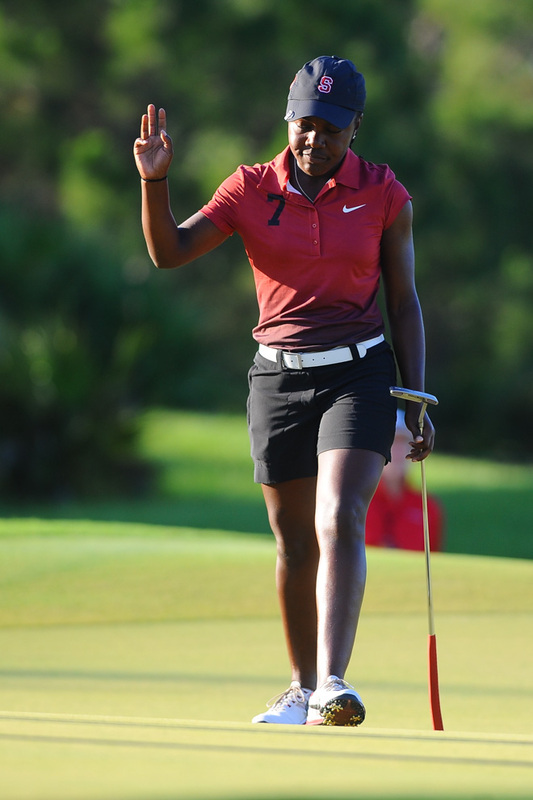 Aubert put the first point on the board for the Cardinal, conceding only two holes in her convincing victory. While Aubert’s performance may have been overshadowed by the heart-stopping finish between Davis and Stackhouse, the freshman had the most consistent overall play for the Cardinal in the knockout rounds, winning all three of her matches. During a season of inconsistent play and numerous injuries, Walker desperately needed a third golfer to consistently join Stackhouse and junior Lauren Kim atop tournament leaderboards, and Aubert slowly emerged as a weapon for the Cardinal. After coming to Stanford as a highly touted recruit, Aubert realized her enormous potential earlier than expected, a development which was instrumental in the Cardinal’s title. “Shannon is just Steady Eddie. She’s going to find a way to win and she loves to win. I had a good feeling Shannon would take her match,” Walker said. Like Aubert, Danielson emerged from an uncertain start of the season to become a consistent scorer for the Cardinal, winning all of her match play events. 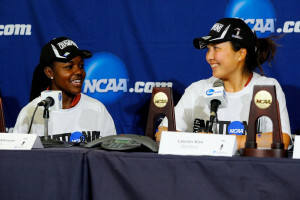 However, her match against Baylor’s Lonardi was a struggle, with Danielson losing a two-hole advantage on the back nine. Danielson’s clutch play down the stretch in the quarterfinals and semifinals helped make up for losing early leads, a pattern she continued in the championship match. With her match all square through 16 holes, Danielson birdied the final two to earn a crucial point for the Cardinal. With Kim, sophomore Quirine Eijkenboom and Stackhouse all trailing at that point in the match, a Danielson loss likely would have meant a runaway victory for the Bears. After a thrilling match and an strenuous season, the championship will certainly be one to remember, being the program’s first ever and Stanford Athletics’ 107th national title. After a thrilling match and an exhausting championship season, Walker and the team were rather succinct about their hard-earned title. Contact Sanjay Srinivas at sanjay_srinivas ‘at’ stanford.edu.